The Intersen Phase includes all pupils from Grades 4-7. It is our aim to create a nurturing learning environment in which our learners will develop a positive self-image and be encouraged to progress to their maximum individual potential. There are two classes per grade with a maximum of 15 per class. Japari follows the National Curriculum and Caps has been implemented in this phase. The Grade 4-7 pupils are exposed to subject teaching and move from class to class, as per their timetable. All the pupils write cycle tests – one test per term for each subject in Grade 4 and two tests per subject for all Grades 5, 6 & 7. 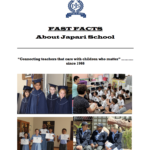 Our Grade 6 & 7 pupils are introduced to formal Japari exams in November. The Grade 6’s also write the Conquesta Olympiad every year in September (only English and Mathematics) and our Grade 7 pupils take part in the annual shared assessment exams in October – Mathematics and English only. Each year our Grade 6 & 7 pupils benefit from a visit from a registered counselor who provides a talk on Healthy Sexual Development. Our Grade 5-7 pupils are also exposed to a study skills course to ensure that meaningful learning strategies are developed. There is also an annual adventure camp for Grade 5-7 pupils during the first term. At the Grade 7 adventure camp, pupils are closely observed for leadership and other qualities providing a sound basis for the making of decisions regarding our mentor/ monitor programme. All pupils are encouraged to participate in our Cultural and sporting activities. All staff provide extra lessons in the afternoons ie. Spelling programmes, Paired Reading, as well as Extra English, Mathematics and Grade 7 Afrikaans.